What comes after Chelsea? It’s the North Wales Festival of Gardens with 22 of the region’s gardens putting on a fantastic show including Bodnant of course. As we walked into the garden there was a sign to say the BBC were filming and that we were to inform the staff if we positively did NOT want to be seen on Gardeners’ World. 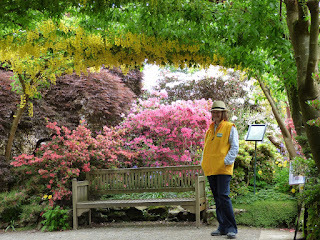 We called in to see the Laburnum Arch, thinking it might be in full bloom, but it was 7 to 10 days away from that. 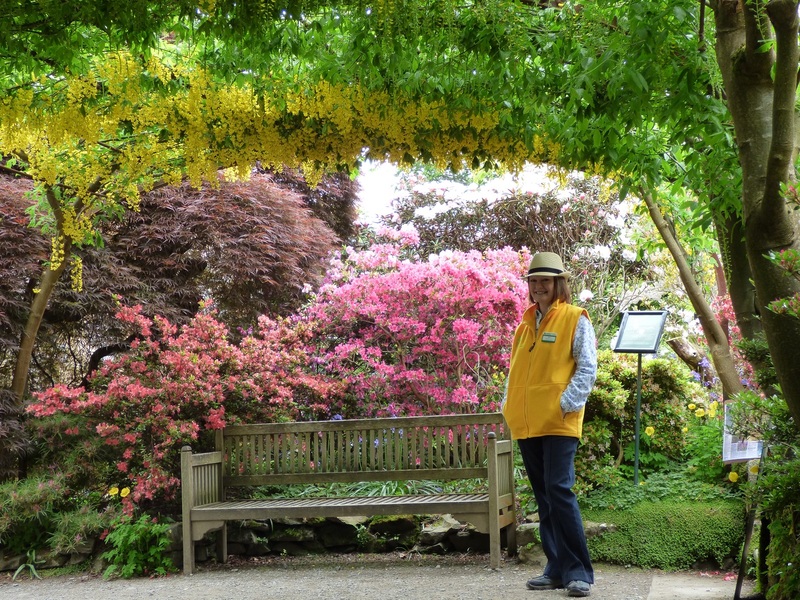 What was in full bloom was a brightly coloured Laburnum Archer. This new species, identified with a badge on the lapel, was one of the 23 seasonal volunteers recruited to ‘manage’ the 3,000 visitors per day who want to see the arch in June. And that, volunteering, is the theme of the episode of Gardeners' World due to be shown on 3rd June. Below is a reminder of what the arch looks like during a quiet moment. I always thought I’d be able to use a shotgun but had never put it to the test. It’s never too late to learn. Sue treated me to a beginner’s session with Bob at the Bob Valentine Shooting School outside Llanbedrog. After a thorough safety briefing I marched out onto one of the fields where, poking out of the far hedgerow, was a clay pigeon trap. Bob took out what looked a bit like a simple TV remote, pressed the eject button and up went the clay. Another button altered the direction and another altered the steepness of the flight. Three times we went through the motion of aiming at a clay flying towards me, following it to the point where it slows and starts to veer away, and firing without a cartridge. Then it was ear defenders on with live ammo. Missed the first. And the second. Maybe hit the third. Then a purple patch. 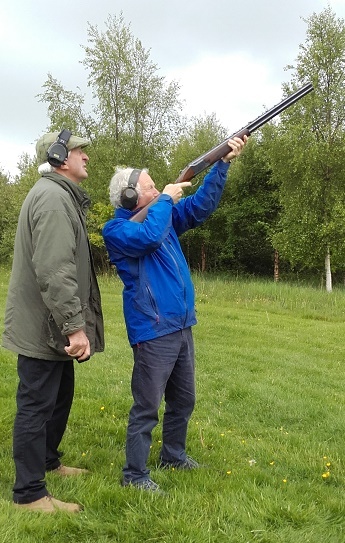 We then switched to a clay flying left to right so the shot needed to be some way ahead of the target. Three different techniques were practised with mixed success. Finally, for a confidence boosting finale, we went to shoot some clays that emulated a teal flying steeply off a pond. They accelerate quickly to a point where energy and aerodynamics are overtaken by the forces of gravity and they become sitting ducks so to speak, 20 metres in the sky. 6 exploding clays in a row. What a shot! If you’ve not tried it before and would like to have a go I can thoroughly recommend Bob Valentine. Full details on his website. Thanks Sue and thanks Bob. All aboard! onto a military 4 x 4 truck and up, up, up, for a quarryman’s eye view of Blaenau and beyond. 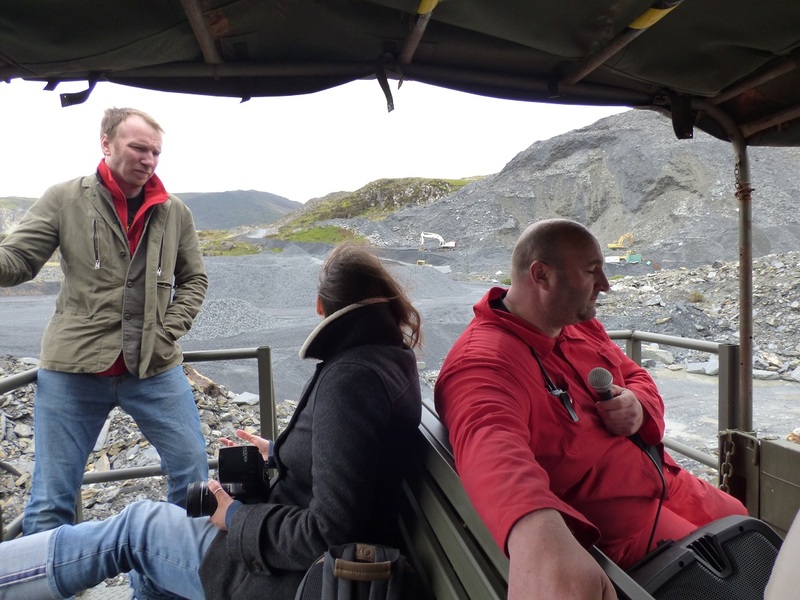 Congratulations to Llechwedd on the opening of yet another innovative attraction - Quarry Explorer. 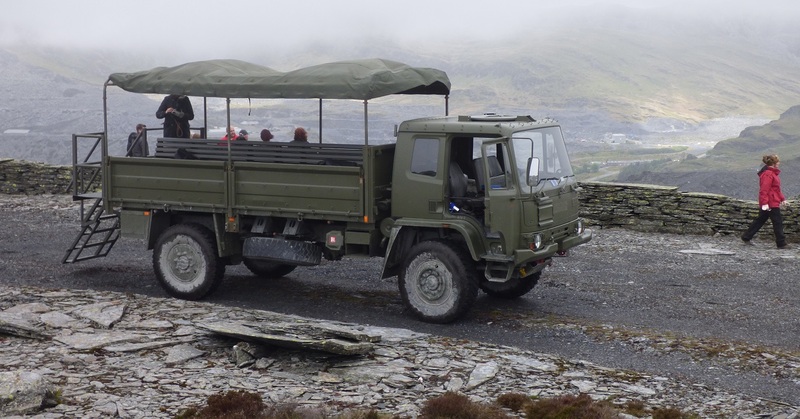 It’s exciting if you go for just the ride and the views but much more so being combined with the history of slate mining. As you are driven around, eight of you either side of a bench on the back of the truck, it is easier to understand the scale of the workings and the hardship endured. It was a tough life and our guide, with a microphone and portable speaker, told us the story. This new offering costs £20 and lasts about 90 minutes – a wonderful introduction to the world of slate. Full details, including excellent aerial film, on the Llechwedd website. The other day I thought I'd tidy up a few stones. A potentially ten minute chore became an exhausting rebuild of the stretch of retaining wall outside the cottage front door. As I toiled away, Sue shared encouraging comments, such as 'no-one will notice'. Personally I think it is fantastic, aesthetically pleasing and much less likely that a stone will fall on someone's foot. 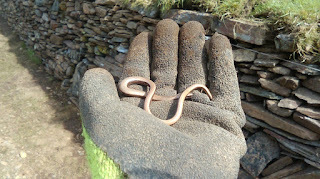 It's also a great habitat for wildlife - I carefully placed a torpid slow worm back into its section of wall. Sue says our regular guests will see that the front door has been painted (her job) but otherwise it's all the same. So PLEASE - on your next visit, don't forget to comment on the wall!